The rest of the KSH that was on backorder arrived today, so I could continue with the wonderful, fluffy stripes. I decided last week (when I was being impatient) that I’d start a sleeve too, so here’s that progress along with the back. It has been easy to keep going with the same colour each time because you’re changing every other row or every row sometimes. Lots of other bloggers have talked about KSH snagging and not running smoothly on some types of needle. I have to say that it’s not been a problem in the least. 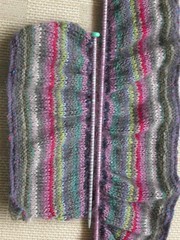 The back is knitting up on vintage Aeros and the sleeves on vintage casein needles. The casein are the best, it just slides off really easily and the slightly fatter points help to keep the KSH together. I’m finding that I have to be a tad more careful with the Aeros because they sometimes only catch part of the KSH. I do have to confess that I’m not knitting in the ends and I will probably regret it………….